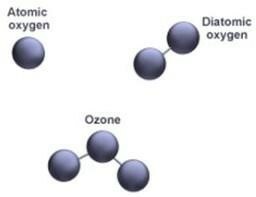 Ozone is an activated form of oxygen. Oxygen we breath (normal oxygen) is two oxygen atoms bound together (diatomic oxygen). Ozone is three oxygen atoms bound together. Ozone is a very energized molecule and reacts with other molecules very quickly. In the water and body fluids , ozone forms Reactive Oxygen Species or ROS. root canal therapy and periodontal therapy.